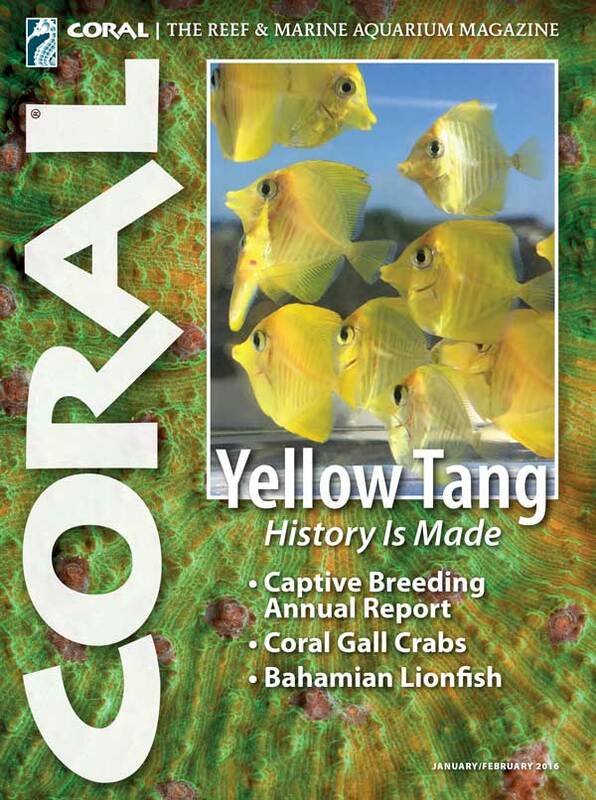 The January/February 2016 Issue of CORAL Magazine is printed and now delivering to print magazine subscribers, local aquarium shops. Here is a sample of articles and opening pages for readers wondering what the issue will deliver. 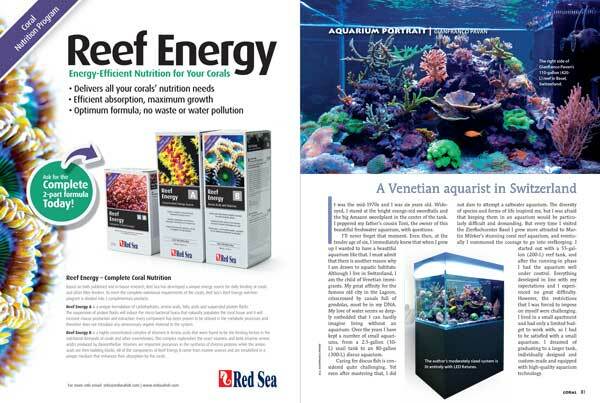 On sale date: January 3, 2016 at the best marine aquarium retail stores everywhere. SUBSCRIBE and don’t miss this big issue—just $37 per year. History is made: Dr. Chad Callan’s team of graduate students crack Zebrasoma Code and are raising the first captive-bred Yellow Tangs. But is their program going falter for lack of funds? Might be time to TANG UP. Some very curious Cyloseris plate corals are showing up as chimeras, as Unique Corals reports from LA. The inside story of the first captive-bred Zebrasoma flavescens as told and photographed by the Callan Lab team at the Oceanic Institute, Hawaii Pacific University. 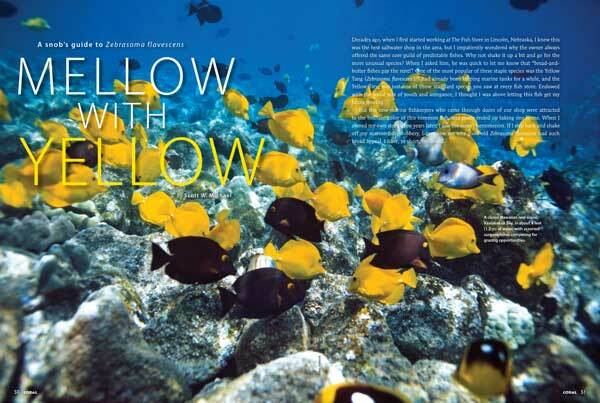 Reef fishes expert Scott Michael takes a fresh and appreciative look at the Yellow Tang and offers his views on how to keep them in the marine aquarium. 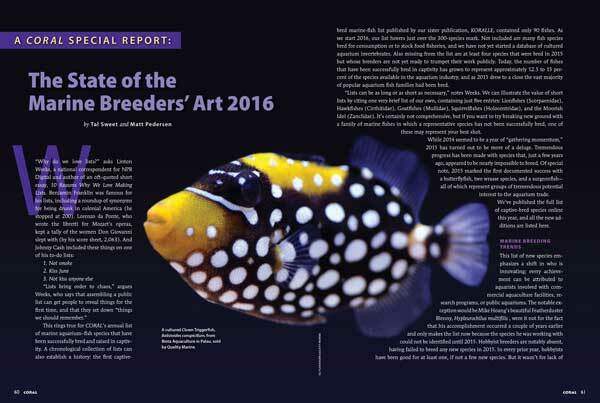 It was a Big Year in Marine Breeding, including Clown Triggers from Palau, as reported by Tal Sweet and Matt Pedersen. 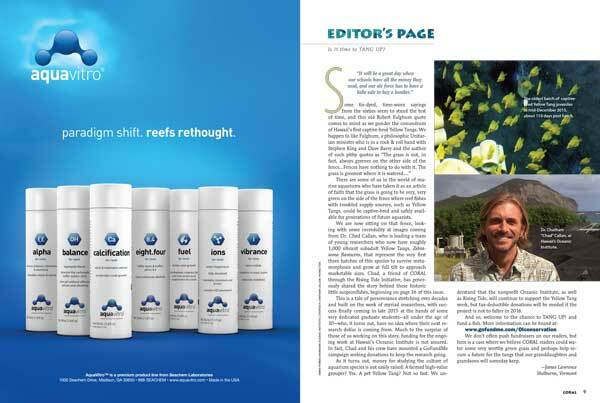 Gall parasites are common in weedy terrestrial plants and trees—and perhaps in your aquarium corals, as Daniel Knop vividly shows in a must-read article. 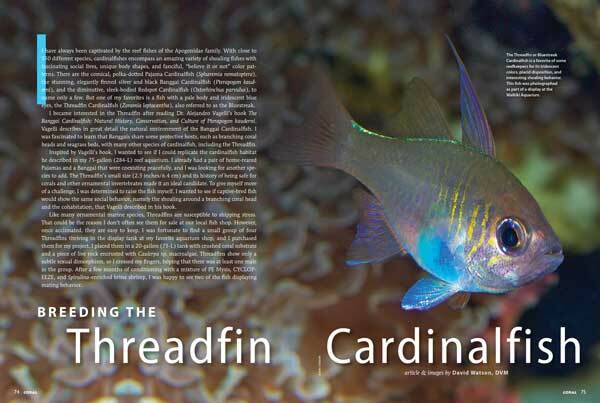 Veterinarian-by-day, marine fish basement breeder by night, Dr. David Watson tells how he has succeeded with the challenging Threadfin Cardinalfish. 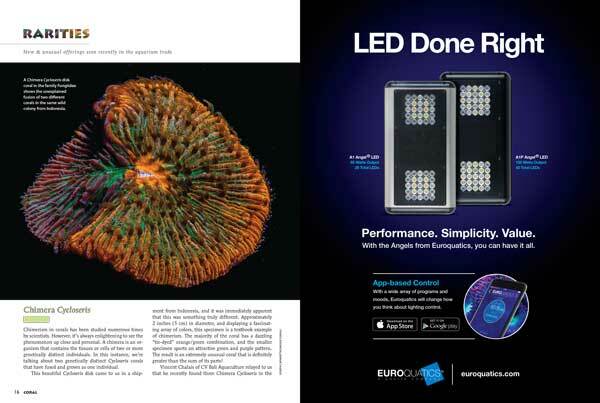 Swiss reefkeeper Giafranco Pavan gives us a look under the hood of his very pleasing 110-g (420-L) LED-lit system in Aquarium Portrait. 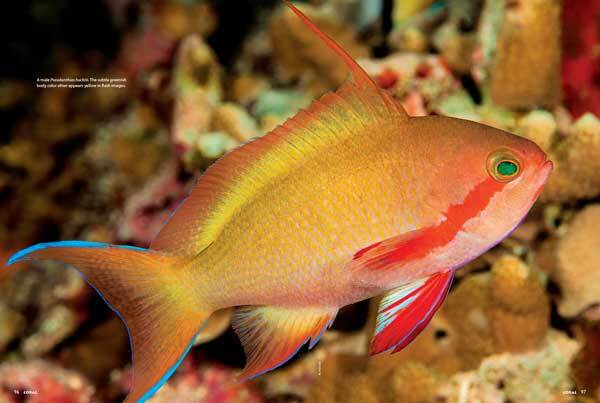 The Green Anthias is a beauty—and not always green—and a hardy member of its genus for aquariums with space and rugged tankmates. 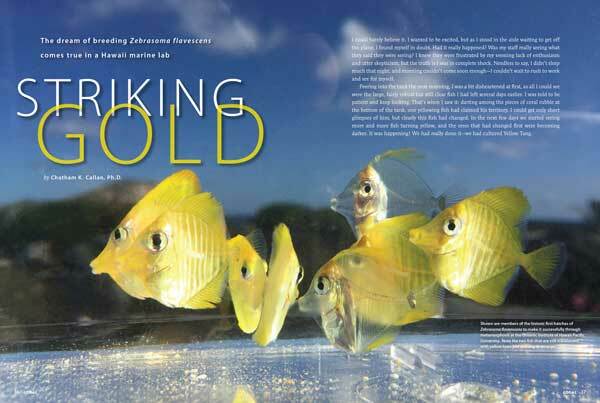 See Daniel Knop’s well-illustrated Species Spotlight for a look at a reef fish worth knowing. • Already a subscriber? ACCESS The Issue Now! 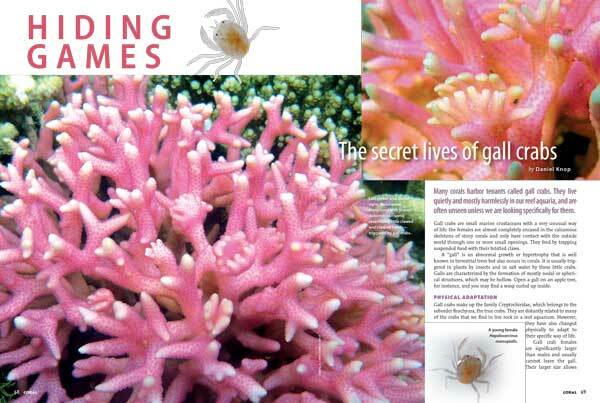 CORAL Subscribers can log in with their email address and read the Digital Edition and App Editions immediately. • SUBSCRIBE and never miss an issue of CORAL. Paid subscribers receive the classic Print Edition, as well as Free Access to the Digital Edition and CORAL Apps for mobile devices.